An assortment of wires and sensors are strewn across a table. Next to them is a single lamp. With the simple click of a button on a phone, the light switches on. 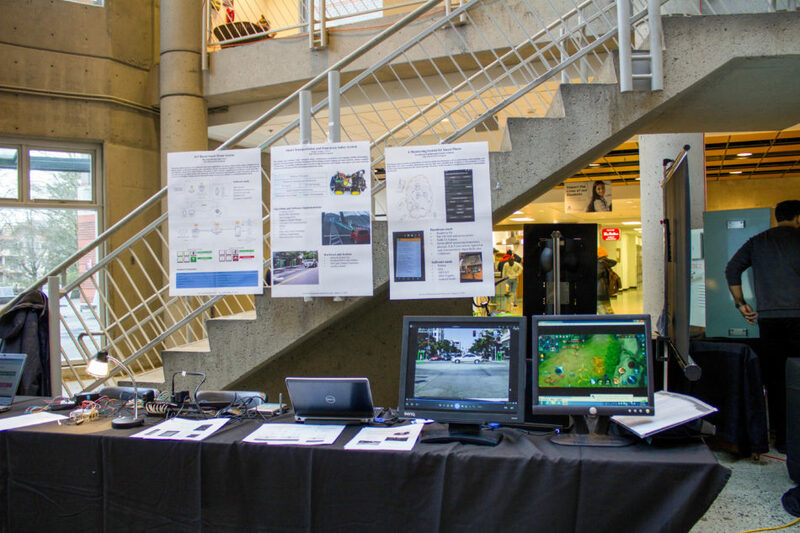 This micro-demonstration of a smart home system was a Kwantlen Polytechnic University-born project presented at Richmond’s Smart Cities Idea Fair. The event served to showcase the innovative ideas that the city has to offer, which could help Richmond land a $10-million grant from the federal government that encourages cities across Canada to improve the lives of residents through the use of data and connected technology. The smart home system was developed by KPU students and instructors in the information technology program. It uses computers, sensors, and internet networks to allow people to turn on and off lights and heaters remotely. It also detects motion and monitors temperature and humidity in a room. The project is connected to a bigger topic in the information technology world: the internet of things. “Originally, we connected all the computers in the world through the internet, but now we want to connect everything in the world through the internet,” says KPU information technology instructor, Xing Liu. Devices, like fridges and doors, can now connect to the internet to collect data and perform tasks. The skills needed to develop this technology are in high demand, as businesses are already installing smart systems in buildings and homes. Ted Townsend, spokesman for Richmond’s Smart Cities Project, was impressed by the smart home system on display. According to him, “the biggest thing that we can do to address climate change is actually in building design.” Because technicians can install smart heating systems that know when you need the heat on, for example, applying these new technologies can make buildings more energy efficient. Wei Li, a KPU information technology instructor, presented a video showing self-driving software at the fair. It identified people on the street, gathering the information necessary to avoid hitting them. Li also presented a video of a machine-learning artificial intelligence system playing an online game. When it was first instructed to play the game, it knew nothing. “It’s like a baby,” says Li. After trial and error, however, it learned how to play the game and became exceptionally skilled at doing so—all without the help of humans. Li described this process as humanlike; like us, different AIs have different learning styles. They have tendencies and personality traits that their creators can not predict. The artificial intelligence in Li’s project turned out to be aggressive. Rather than covertly and strategically winning the game, it constantly fought with anything in its way. Li said there is a solution to this problem. We must train any artificial intelligence that uses machine learning by positively reinforcing good behaviour, such as by giving it bonuses. In Richmond’s Smart Cities Challenge proposal, there are plans to implement machine-learning algorithms to monitor traffic and mitigate disasters. While the winners of the competition are being decided, KPU students and instructors will continue to help create technology with the potential to bridge the gap between science fiction and reality.